Spiering & Co | Summer in the Oxford Botanical Gardens! Last month, 396 years ago, the Oxford Botanical Gardens was founded ‘To promote the furtherance of learning and to glorify nature’. It is the oldest Botanic Garden in Britain and it is still fulfilling the mission it set out to do nearly 400 years ago. The setting of the landscape itself is inspirational with vistas that take your breath away. More importantly to my mind, it is not just a place of beauty, but a place of learning as well. Photo 2 shows a perfect depiction of the ‘designed abundance’ that a truly well designed herbaceous border can have. 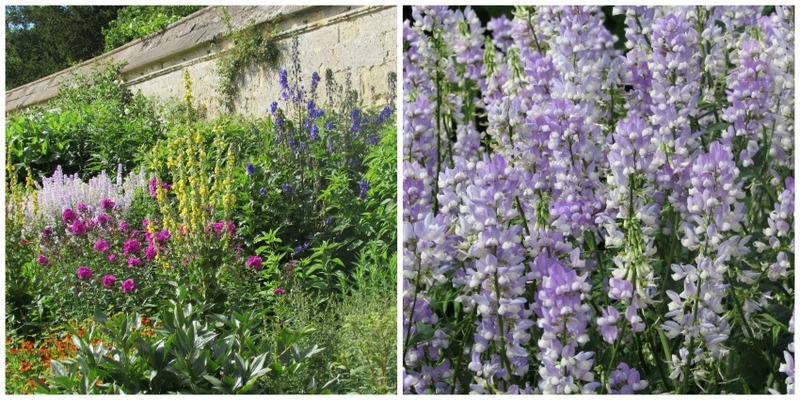 These borders are full of contrasts, not just of colour, but also of texture, shape and height. They flow quite naturally, as the design is subtle, and they invite you to pause and look at certain points along the planting border. The contrast of the dark purple flowers of the Phlox paniculata ‘Dusterlohe’ as seen in Photo 2, was glorious in front of the light, lavender blue spikes of Galega ‘His Majesty’, seen again in Photo 3. Galega ‘His Majesty’ is taller, growing up to a metre, and has a delicious coconut scent. Beautiful! How many times do you see a perennial that is over 3 metres high! The Onopordum acanthium is one such plant. Robust and tall and definitely making a statement, the ‘Cotton Thistle’ has oblong grey felt like leaves and a large thistle like purple flower. It is happy in most soils but not acid soils, and needs sunshine to flourish. 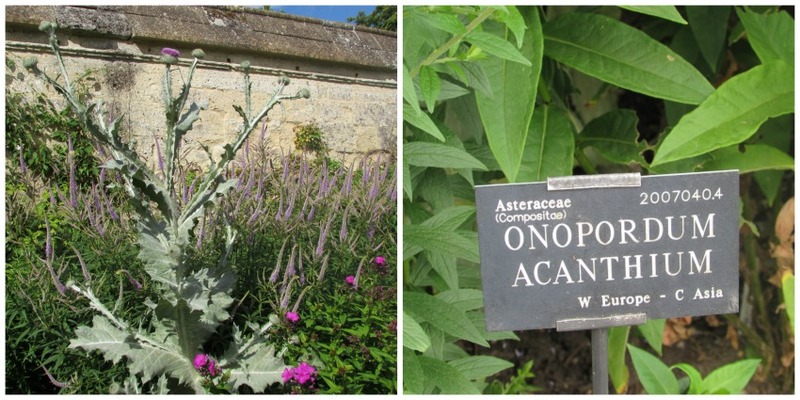 I would not have known the name of this plant, but as we know, one of the missions of the Oxford Botanical Gardens is to teach, so many of the plants have all the information you need placed at the base of the plant – see photo 5. Then we come to the famous Merton Borders which are a new, sustainable, approach to designing herbaceous borders. The borders are sown from seed and have the ability to withstand the predicted climate change to a dryer, hotter UK.